to prove they played their part. only to return to what we’ve got. exploitation of an expanding population. that we can’t seem to find within. reminding us of the cold days we can’t escape. only know to destroy and pollute. of an edifice of reticence. and there is no truce. because it’s all too late. we’re all part of this murdering. reveal to us the original trauma. the edges of our control drama. for something that will make it all better. At what point was life not enough? At what point did the heart not matter? Let’s go deeper to find the relief. November 26, 2010 — feeling frustrated and full of love all at once… For more info on Eco Arts Awards, go here. >Lindsay, I feel the rant and like how your language, rhyming, reinforces it. Zinn was an amazing man. Just brilliant Lindsay. I feel you, I hear you, you’re a voice crying in the wilderness – so clear. Love your spirit, love your heart, love you. Thanks folks for all your support! 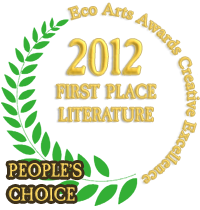 This poem was awarded the 2012 Eco Arts Awards, People’s Choice, first prize — thanks to you that voted!